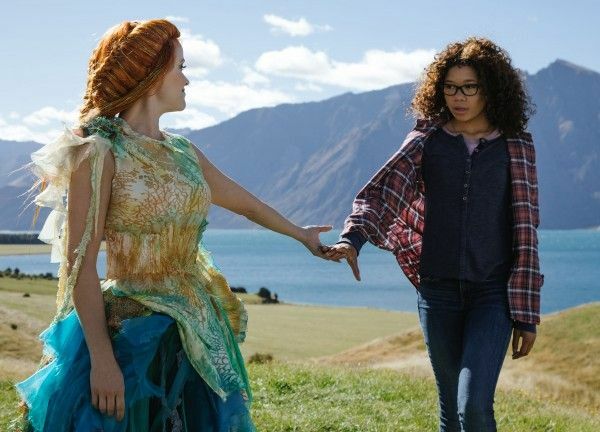 On a sci-fi/fantasy project like A Wrinkle in Time, every department of the production, from design to costumes to hair and make-up to props, to visual effects, etc., has to be firing on all cylinders and collaborating together as one cohesive unit. And while the characters from Earth have everyday wardrobe, hair and make-up, it is a story that travels through time and space and to other planets, and that includes characters who have a wide variety of looks, each fitting their personality and providing a visual representation for who they are. On February 2, 2017, Collider (along with a handful of other online outlets) was invited to the Santa Clarita, Calif. set, where we got to talk with lead hair stylist Kimberly Kimble (known for her work on the Lemonade project for Beyonce). During the interview, she spoke about how the hair styles are based on the character and what works with the person who’s wearing it, collaborating with director Ava DuVernay on the creation of each look, developing the style for each of the Mrs. (played by Reese Witherspoon, Oprah Winfrey and Mindy Kaling), how the hair team works together with the actors, and the way that the wigs are stored. Question: Which hairstyle for the film is your favorite? KIMBERLY KIMBLE: I have to say they’re like my children. They’re all my favorite! There’s a lot of great hairstyles, and I’ll say that each style matches each person. Some may be a little more out there than the others. They’re just based on their character and based on what works with the person that’s wearing it. How did you develop the look for the Happy Medium? KIMBLE: I almost said that was my favorite! He looks so cool, with the braided man bun. That was really fun to do. What was it like to collaborate with Ava DuVernay on the creation of the looks for these characters? KIMBLE: Ava [DuVernay] had a lot of input. We had several meetings with her, and several meetings with the actors and the costume and wardrobe. It really is a collaborative thing. It all has to work. The costumes had a lot of inspiration, and Ava gave us a lot of inspiration of what she wanted. What did you want for the three Mrs.? How did you develop the look for each of them? KIMBLE: One thing I knew was that it needed to be from another world. These women are cosmic universal beings, so when you see them, they’re not your average hairstyles. I knew that Ava really wanted that, and I thought that was perfect for the characters. Mindy [Kaling’s character], Mrs. Who, is a mixture of cultures. That’s something Ava threw out. Kind of like a quilt, her hair is very culturally inspired. It’s a little bit of Africa, a little bit of Asia, a little bit of India, a little bit of Colombia. It’s a lot of little things that we put together, so it’s not an exact one thing, but if you look at it, you see the inspirations from that. Now Reese is more the spiritual flower child. Although she’s got very vibrant hair, it’s very natural, touchable, soft and moveable. 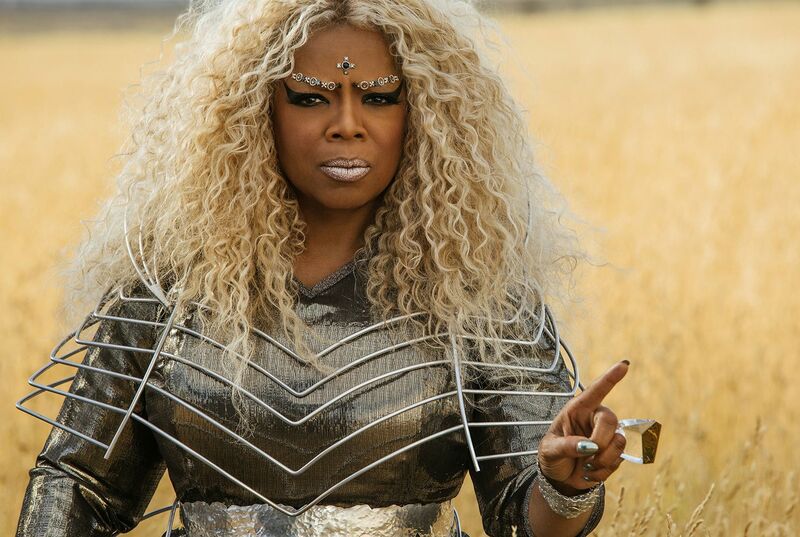 And of course, Oprah is the galactic diva. She’s bold with this mixture of metallics – like blondes, golds, platinum and silver – in her hair. It’s very bright. You’ve never seen any of these women like this before, and that was something that Ava really wanted, to make sure that they get into character. All of the women were very excited about coming into hair and make-up because they got to transform into someone else. It was always very fun and exciting for them. I had a lot of fun putting it all together, and I think each one fits each person. It fits the character and who they are, which was a process. I think we started in September . I started creating vision boards for the director to see, for the talent to see, and for the wardrobe people to see, so that we could collaborate. It took us quite a bit to build a lot of wigs and hair pieces, some by hand, and we used custom wig makers to create these pieces. One of the things I thought was really cool and interesting, and that makes these women very fabulous, is that they change with every planet. Every time they go to another planet, they have new hair and new clothes. Was that scary, at all? KIMBLE: It was a little bit like, “Okay, that’s five changes for three women? !,” and they all had to be spectacular and creative. It was definitely challenging, but I love challenges. I like to work on films and television, and I do a lot of music videos, so I’m used to working with a lot of creative people. I work a lot with Beyonce. She’s one of my clients. I did the whole Lemonade project with her. I’m used to really pushing the envelope, but this was very challenging. There was a lot of detail and a lot of work. And then, of course, we have our lead – our Meg – with her beautiful curly hair. It’s great because natural curly hair is such a big thing right now. I just think that the hair has something different for everybody, and it’s still relatable. A lot of our inspiration came from braids and texture, and I think that’s very relevant today. A lot of women are doing those side braids, or two braids. I’m very excited for the world to see it. It’s a great project. When Halloween comes, people are gonna be picking who they’re gonna dress up like. It’ll be the best Halloween costumes, but they’ll probably have to have me help them with the hair because it’s not the easiest. What’s it like in the mornings, when you guys are getting hair and make-up ready? What’s the daily set process like? KIMBLE: We have a pretty large team, on a daily basis, because there are a lot of wigs involved. You almost have to have one person for every one or two people, to put a wig on. Normally, on a daily basis, you have two or three people in the hair department. For us, we have four on a small day, but usually four to six and sometimes even seven people, which is pretty large for a hair team, but it’s a lot of work. We need to get them in and out. For this kind of hair, I knew we had to do a lot of planning. We have a system that we do everyday, and we pretty much stay on time and we meet our deadlines, but we definitely have to have enough hands to keep it working. Which hairstyle takes the longest, and how long does it take? KIMBLE: In all honestly, it’s most of the women’s hair. Most of them are wigs, so we’ve prepared them all, but they took a long time to construct. For Mrs. Who, which is Mindy, her wigs took the longest. There’s a lot of intricate braiding and pieces that we put together. She has one where it’s a bunch of braids sewn together. That took about five to six days. A lot of them took about five to six days to construct, and sometimes I even tore them down and redid them because they weren’t right. We did a lot of tests. Luckily, by the time we got through the tests, pretty much everything got approved and we didn’t have to redo anything, after that. It’s just a building process. We worked on it for at least two and a half months, creating all the hair. First, we had to get our lead actress’ hair right. Then, we went right into the Mrs. and started working on their hair. We had to wait for the wigs to be constructed, and those took a couple of weeks, and then we made all the hair pieces in the trailer – me and my team. I want to say the longest one probably took about seven days to create. That’s just the styling part. That’s not building the wigs. You said that the looks change with each location. Does the hair ever affect the set? KIMBLE: It has not had to because everything was very planned out. We actually did a board and put the hairstyles with the costumes, and they sketched it all out and put it all together. That way, you could see it and test it against everything. Everything was very planned, so they didn’t have to change the set, as a result. We’d probably just have to change the hair. We were very lucky that we pretty much nailed it because there was a lot of pre-planning and a lot of prep work. The director saw it all, visually, before we actually finished it. I’ve done a lot of things, but this was probably the most pre-planned movie that I’ve done. How are the wigs stored? KIMBLE: We have a specific trailer for the Mrs. because there’s a lot of hair for them, and we also have doubles. We have to give them their own specific trailer, so we have two different trailers. Do you know how many pieces you’ve created, in all? KIMBLE: Each Mrs. has five looks, but it’s four wigs apiece that we work together with. That, right there, is 12 wigs. Plus, we have the doubles, and we have all of the main cast. It’s a lot of wigs. I want to say that it’s at least 20 to 25 wigs total, with the doubles, the stunt doubles and the main cast. A Wrinkle in Time opens in theaters on March 9th.